Sterling Silver? Silver plate? 18/10 Stainless Steel? Pewter? Today the choices for flatware can be overwhelming. Not to mention that entertaining and dining style and trends have changed drastically in the last 10 years. Below we've put together answers to the most frequently asked questions we get when helping customers select flatware. Sterling silver flatware is made of at least 92.5% pure silver. Any flatware that is sterling will be stamped with the word “sterling”. Sterling silver flatware is very expensive and is considered to be the most elegant and formal of flatware. Sterling silver flatware has a warm glow and requires occasional polishing. The best way to keep sterling flatware lustrous is to use it regularly. For optimal care, wash sterling silver flatware by hand in hot water with a mild dish soap that does not contain lemon or citrus additives and dry immediately with a soft cloth. Silver plate flatware is a less-expensive alternative to sterling flatware. Silver plate flatware has a layer of 100% silver coating another metal, usually nickel. The thicker the silver layer, the better the quality. Silver plate flatware has the same warm glow as sterling flatware and also requires occasional polishing. The best way to keep silver plate flatware lustrous is to use it regularly. For optimal care, wash silver plate flatware by hand in hot water with a mild dish soap that does not contain lemon or citrus additives and dry immediately with a soft cloth. Pewter, a metal alloy, is made of at least 85% tin, with the remainder consisting of copper, antimony, bismuth. In colonial America, pewter was prized for its strength and durability. Pewter flatware has a rustic feel and beautiful patina. Pewter does not require polishing. For optimal care, wash pewter flatware by hand in hot water with a mild dish soap and dry immediately with a soft cloth. Most flatware is stainless steel. Stainless steel flatware does not rust or tarnish and does not require occasional polishing. Stainless steel is a metal alloy that contains a minimum of 10.5% chromium. To make stainless steel flatware, chromium is added to steel for strength as well as rust and stain resistance. Nickel, another metal alloy, is also added to the steel for its brilliance and lasting finish. The grades of stainless steel (18/10 or 18/8) refer to the amount of nickel added to the steel which prevents corrosion. The best grade of stainless steel is 18/10. Stainless steel flatware is dishwasher safe. 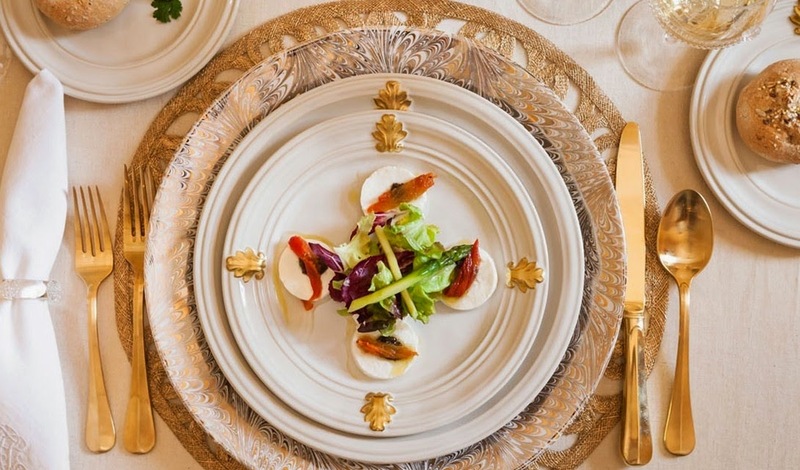 What is a 5-piece place setting? A 5-piece place setting consists of a dinner knife, a dinner fork, a salad fork, a soup spoon and a teaspoon. Due to changes in entertaining and dining, a lot of flatware is now sold individually as well as a 5-piece place setting. People who do not tend to entertain so formally are now opting for an 'a la carte' approach to flatware and do not always purchase salad forks and teaspoons. However, the salad forks and teaspoons do double as dessert forks and dessert spoons and become part of the dessert buffet. When selecting flatware, think how you entertain. Today, there are no strict rules. And, if you need help, give us a call at 847.518.1232. We're always here to help. Searching for Flatware? See our recommended flatware collections.